when-a-brewery-collides-with-the-farm-it becomes a family event! 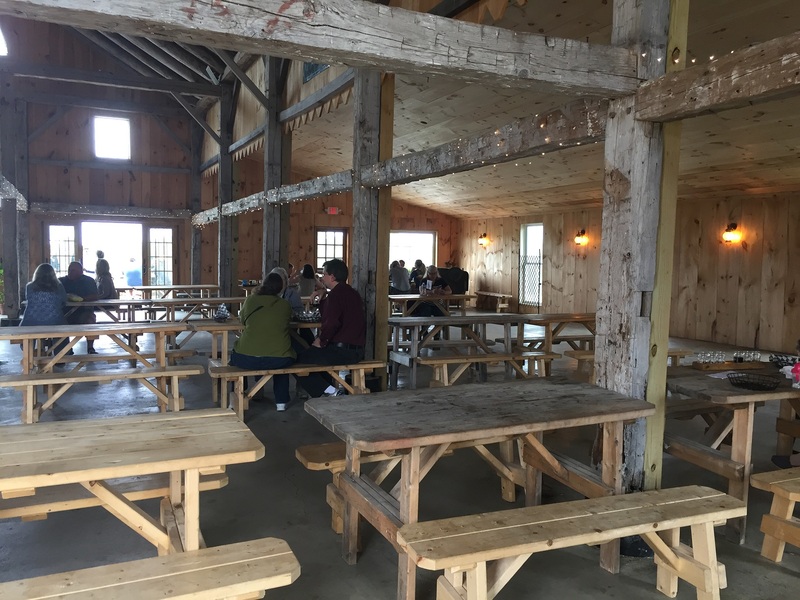 Home / Beer • brewery / When a Brewery collides with the Farm…it becomes a family event! 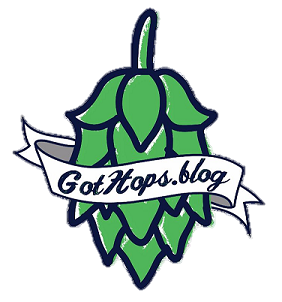 Typically, when I’m checking out new breweries, I don’t always think blog post. I’ll visit a place two or three times or more to get that feel for a good write. For me, the beer is what gets me there; the experience along with good beer keeps me coming back for more. On this trip however, which is a unique place, the first person I spoke to behind the bar while pouring my beer just happened to be co-owner Shawn Dubois. Sometimes the opportunities to write about my trips are handed to me. This definitely emerged to be one of them. If you have ever driven by the monolithic granite looking statue on Rt. 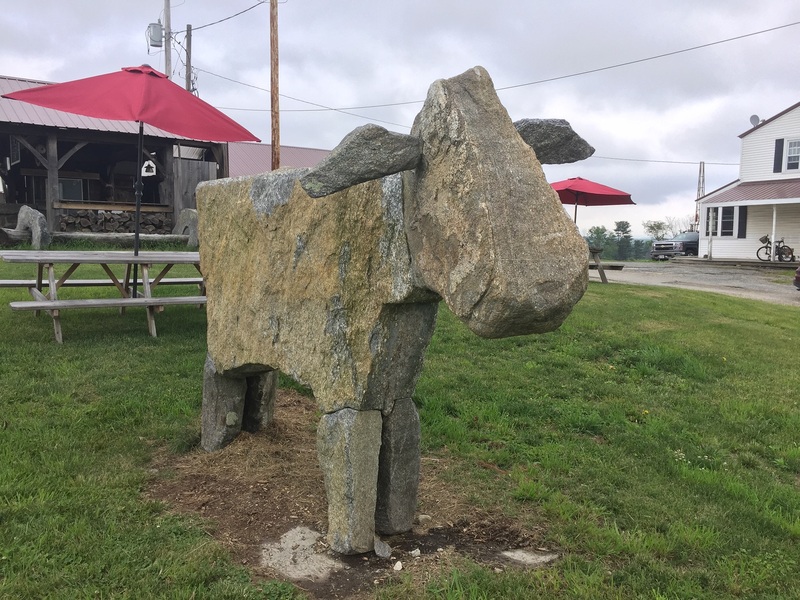 122, shaped like a cow, just north of the Barre MA common, then you have driven by Stone Cow Brewing. As an independent contractor, I am behind the wheel driving somewhere often. I have driven by that stone cow structure many times and witnessed the sculpturing process unfold weekly. All of it taking place in front of the farm stand looking store called Carter & Stevens Farm. You might also remember watching a series of Dunkin Donut commercials advertising their new pumpkin flavored products several years ago. One of those commercials was filmed on the Carter & Stevens Farm long before the brewery was ever open. 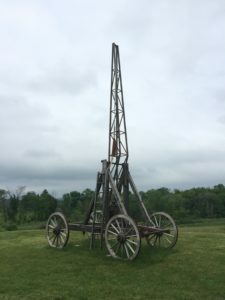 The pumpkin throwing catapult being constructed on the property for said commercial, now converted into a working trebuchet, was left behind after filming was complete. 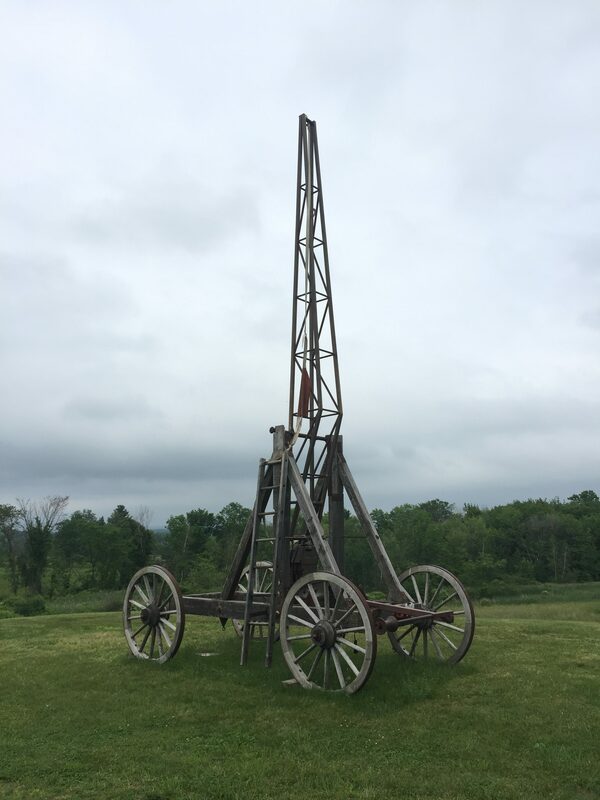 According to Shawn, it can throw a pumpkin about 500 feet into the field. As an engineer and mechanical designer, I totally approve! Here is link from the T&G about the event. 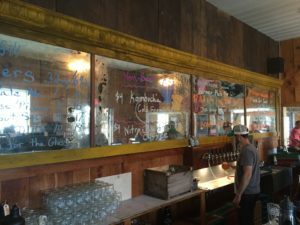 As Shawn was handing me a Stone Cow DIPA called One Way Sunset, I inquired about the very long mirror on the wall behind him, which had today’s tap list written on it. And when I say long I mean…loooong! A locally owned pharmacy dating back many years ago, located not too far away, donated the mirror to the brewery. Shawn mentioned how honored he was by the opportunity. Additionally, everyone involved in getting the mirror to its new home were very happy to see it stay in town, as is, not being flipped, or restored. History is very much a part and equally important to the brewery and the farm. There is a sense of local pride too. The brewery is also a working pasture based farm. One that’s been around since 1938, with milking cows and they even have a hop garden. Plans are to make the hop garden bigger with more variety, to create more styles of beer to offer willing beer geeks like myself. The spent brew grains as you can imagine are fed to the cows and the land the brewery and farm are on spreads over 1000 acres, which is just a little smaller than the town of Chelsea, MA. 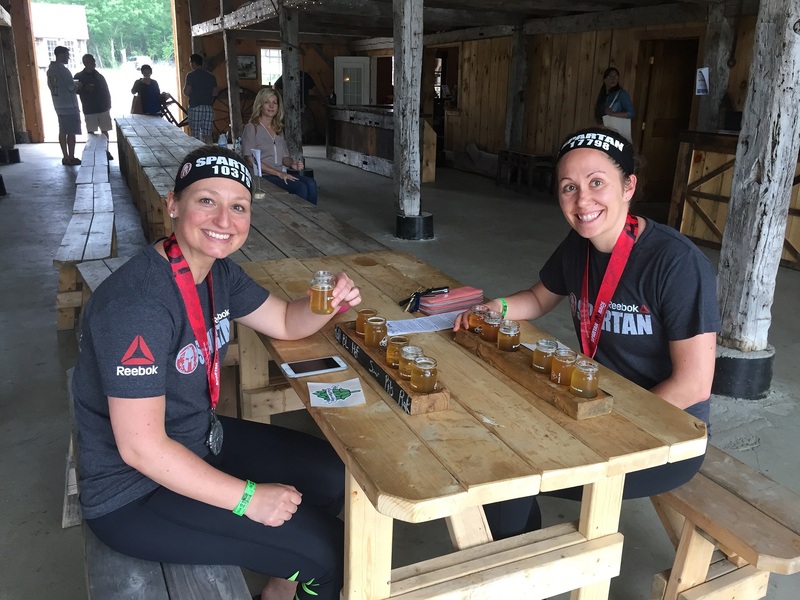 The property also plays host once a year to a Spartan Race, which you can get details of here. Shawn commented that the race is probably the best way to see the property. Most of the course traverses thru and around areas that some of the employees don’t ever get to see. In fact, Shawn and his wife Molly both participated in the race last year. They were amazed to witness how team oriented and community based the race was, which is mostly strangers helping strangers lending a hand to conquer physical obstacles. Having entered one of these, I would totally agree about the community aspect, which is fitting especially for the brewing community. I cannot think of a better way to end your race day with some frothy goodness too. Speaking of community, I asked Shawn how long the brewery has been open and if he sought advice to start the brewery. As usual in the beer community, he received plenty of the latter. Once again, Cedric Daniel of Rapscallions name proudly mentioned as a contributor. I was surprised to learn Stone Cow has only been open since July of 2016. I have heard so many great things about the brewery that one would have thought they have been open for years. A true testament to the experience they offer! The brewery has a good variety of beers on their menu. The DIPA I had was very tasty. I also tried the wheat beer appropriately called Heifer-Weizen, which was light and very drinkable. It makes for a go to beer on a warm day. Stone Cow does offer food services as well. They make a killer Panini BLT, complete with their homemade herb mayonnaise. I should have bought two, one for there, and one for when I got home. Just so good! As I was walking around with beer in hand, I asked how the Stone Cow in front came into view. Seems Shawn’s father-in-law needed something to do and started to gather the granite stones from the property. As any true New Englander would know, these stones are a New England countryside staple, just like snowstorms in January. Interesting to note, none of the stones that form the shape of the cow were chiseled or cut. All were found on the property as is and they started to build the granite structure once they had all the basic shapes needed, and the cow is quite large too! 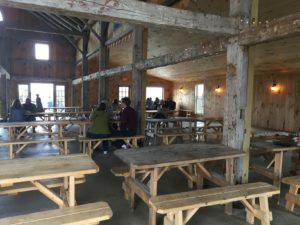 Shawn recently discovered the newly constructed old post & beam barn that serves as a seating area next to the brewery, was once owned, by the Stone family. 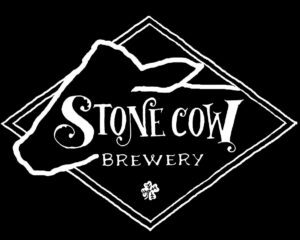 Very fitting and you could say Stone Cow Brewery has come full circle. My day at Stone Cow went from interesting to special. A day that I thought was going to be a casual visit to sample a few different choices of Stone Cow hop infused goodness. So good, I left with two 64 oz. growlers. Assuring that I will be back to take in the gorgeous landscape of a true working farm, set on a very large piece of property, hosted by the ever nice, extremely approachable and gracious hosts, Shawn and Molly Dubois. How can you possibly go wrong with any of that? My advice is to add this place to your journey and get the experience I did…you will not be disappointed! 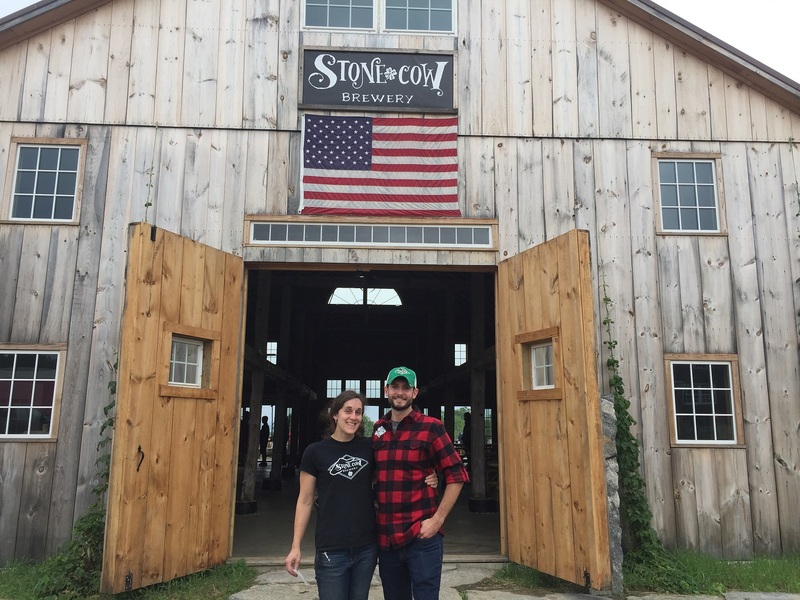 Thank you Shawn & Molly and the entire Stone Cow staff! You can also find other posts and pics on Twitter and Instagram. I recently revisited the Stone Cow on July 8th to take in their first BBQ weekend of the year. There were many in attendance for the beer, the BBQ, and the music of Big Jon Short. There were families young and old, from 3 to 70. Kids playing in the puddles as it rained while parents were enjoying the beer and music, and the BBQ food was delicious! Sitting outside on the stone patio on back of the barn, a highly recommended Farmer Phil’s Pilsner in my hand, with a gorgeous view of the farm, music echoing thru the hall making its way out thru the patio doors was just complete awesomeness! Click below for a gallery of pictures taken of my visit. 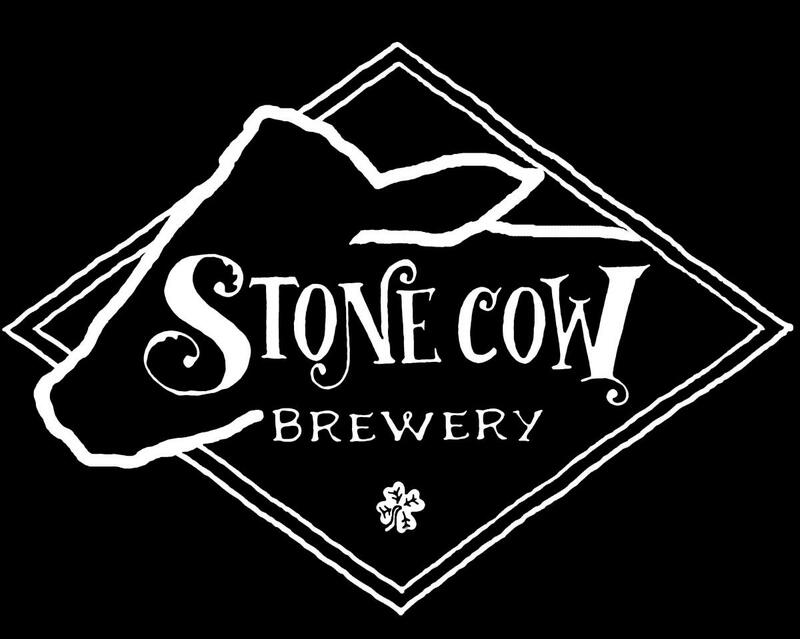 Feel free to use and share but please give proper credit to Stone Cow Brewery and GotHops.blog. Thank you! Awesome read Ed! Great place to visit and sample good beer.